UKIP. Schadenfreude’s such a lovely word! I can’t help but look upon the imminent demise of UKIP without a certain frisson of pleasure. A party that’s done more to ruin the UK’s reputation abroad and helped deliver the shambles that is Brexit is about to get its come-uppance – as blogger Tim Fenton mentioned today. Ukip’s most recent accounts show it was £380,630 in debt before the 2017 election which weakened the party’s finances even further. The party’s so skint it can’t even put up candidates in local elections. The parlous state of the party’s finance have been the subject of infighting in the past and an open secret amongst members (link). Now UKIP can’t afford another leadership election, which might save the skin of the latest temprorary Leader (the 4th in 15 months), Henry Boulton, despite the revelations about his openly racist girlfriend – Jo Marney. Jo’s provided social media with an open goal, so I make no apologies for sharing this pic of the couple caught together on the London Underground after their supposed ‘split’. Oh, and the Twitter commentary from Scott Ballantyne is inspired! Meanwhile, former UKIP leader Nigel Farage has got himself embroiled in the murky world of American politics, Trump, Assange and Russia…(link). There’s no chance of him riding to UKIPs rescue as there no money in it for him anymore which leaves the party stuffed. Even MEPs and some of the remaining local Councillors are jumping ship. John Arnott, the MEP for the North East of England, said he had lost confidence in Mr Bolton but thought no better of those “jockeying” to replace him. Of course, UKIPs collapse spells even more trouble for another bête noire of mine, the Stop Hs2 campaign! I’ve not seen any evidence that UKIP helped the campaign financially or practically, other then lending it support via social media & having members who had a foot in both camps. But UKIP did help draw attention to the campaign. Their opposition to Hs2 was nothing more than a cynical ploy to attract votes from disaffected Tories who lived on the HS2 route. The problem was that the Stop Hs2 campaign had always exaggerated how much support it had, so the avalanche of votes UKIP hoped for never materialised – even in the Chilterns, which was the ‘hotbed’ of anti Hs2 activity. They gained (and then lost) a couple of Council seats but never seriously threatened to unseat any MPs. UKIPs demise will leave the Greens as the only party opposing Hs2 – and they’ve got their own problems as their standing in the polls and share of the vote in recent local elections has fallen dramatically. As an illustration of both parties troubles, here’s three local election results from Thursday. The stophs2 campaign had conned UKIP into believing Hs2 was a vital election issue and ran a risible ‘no votes for you with Hs2’ campaign. It was complete hogwash of course. The truth is that (even in the Chilterns) the only people who really care about Hs2 either live directly in its path or are just outside the compensation zone. The 2015 election was a disaster for both sides as it exposed both were writing cheques neither could cash. Despite this, both sides still cling to the same fictions. UKIP still think opposing Hs2 will win them votes & the anti Hs2 mob still pretend they’ve electoral clout. So last nights result in the local elections in Chesham (a supposed stophs2 stronghold) will come as a nasty reality-check for both sides. – well, rails really, but you know what I mean! After a day at home I’m heading South on Grand Central’s 08:04 from Halifax to Kings Cross. I’m actually on my way to Norwich as Abellio Greater Anglia are showing off the first of their refurbished Mk3 sets to the press tomorrow. Norfolk’s county town isn’t the easiest place to get to from West Yorkshire so I’m heading down a day early & using the time to get pictures for my library. For once I’m not working over a bank holiday & I’m looking forward to having some quality time at home on my return. 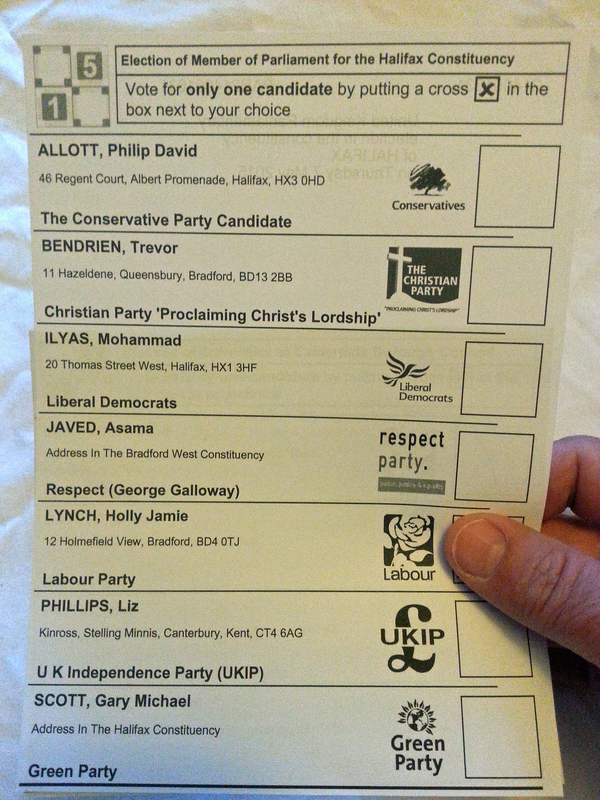 Before I left this morning I remembered to get my postal ballot in for the general election. The list of candidates caused a wry smile. Despite the range of parties they all (bar one) had something in common. They all live in Yorkshire. The one that doesn’t is (yep, you’ve guessed it) the UKIP candidate, who actually lives in that well known Yorkshire town of Canterbury, Kent! Election special: Farage’s fag packet calculations are more porkies. This month all the major political parties reiterated their support for building Hs2, much to the frustration of the anti Hs2 campaign who’ve clearly had their bluff called. The antis may be busy on social media pretending otherwise but in the real world it’s clear their campaign’s unraveling rapidly. None of the major political parties see them as a credible political force they’re going to lose any sleep over. Only UKIP & the Greens oppose Hs2 & this week UKIP unveiled their Hs2 campaign poster. I have to say, it’s stunning in its blandness. ‘UKIP will stop Hs2 before it runs out of control’ it whimpers. Note Farage’s claim that “Penzance is five hours 11 minutes from Paddington. It was quicker to get to Penzance before the First World War”. Really Nigel? Let’s examine that claim shall we? Today’s fastest service between the two is the 10.06 Paddington – Penzance which takes 5hrs 5mins (not 5hr 11mins as Farage claimed, no train service takes that time). It stops at Reading, Exeter, Newton Abbot & Plymouth before it enters Cornwall. Sim Harris, the Managing Editor of Railnews (and a Cornishman himself) tells me this: “The best London-Penzance times in 1902 and 1947 were c.9h30 and 7h00 respectively. In summer 1960 (still with steam) the 10.30 ex Padd managed 6h05 (but this was non-stop as far as Plymouth, where an engine change was required). In 1971 the best time was 5h35, but that was again the 10.30. (*others were still taking 6h00+). Only the BR Intercity 125s made the present timings possible”. So, Farage is caught out telling porkies yet again. There’s a surprise! So, there we have it – Farage’s factoid farrago. Once again UKIP haved proved that – as far as they’re concerned, facts are what you make up. Why the anti Hs2 campaign won’t be celebrating Hs2’s 5th birthday..
Ironically, today the campaign against Hs2 is ‘celebrating’ the 5th anniversary of the announcement of the project. You would have thought they’d have known better as all they’re doing is drawing attention to their five years of failure in trying to stop it! In the intervening time, things have got worse for their campaign. The Hs2 Hybrid Bill Committee continue to plough through petitions & remain on course for the Bill to gain Royal Assent by December 2016. You can see why UKIP & the anti’s get on, can’t you? Both groups largely rely on imaginary friends! Meanwhile, things continue to get worse at home. At the Hs2 Committee hearing on the 10th March, Denham Against Hs2 Chairman Frank Partridge let the cat out of the bag about the number of Hs2 ‘Action’ groups. The likes of Hs2aa are still pretending there are over 90. Frank admitted to the Committee that the real number is ’40 to 50′ – around half the numbers claimed! More proof (if it were needed) that the campaign’s been exaggerating the size of its activist base. All this leaves the anti Hs2 campaign with bugger all to celebrate on Hs2’s 5th birthday. If I was Joe Rukin, I’d be too busy looking through the ‘situations vacant’ columns to be boasting about how a lot of imaginary voters are going to Stop Hs2…. 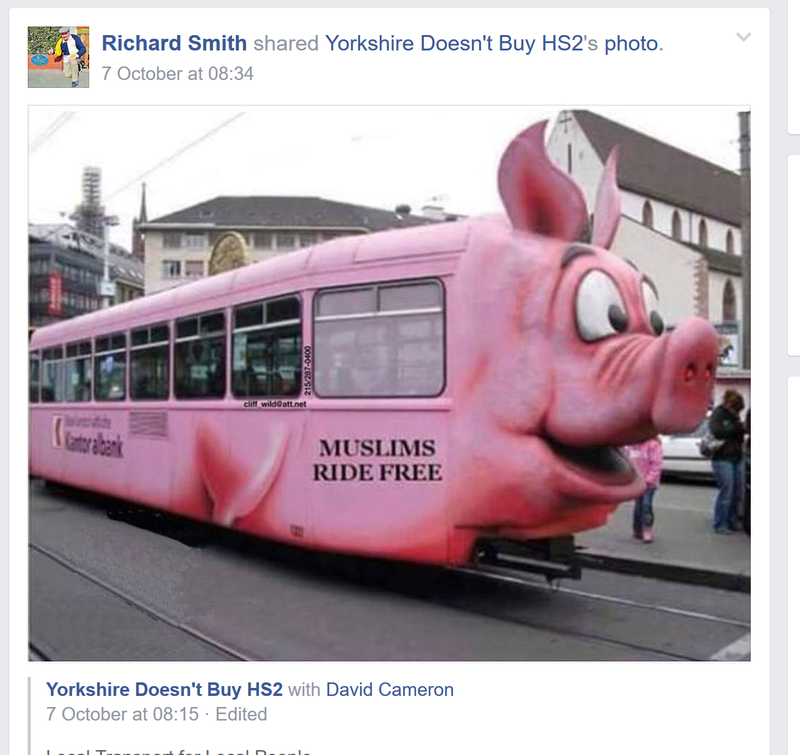 My previous blog about UKIP & the anti Hs2 campaign both being a bunch of fantasists caused some squeals from the certain quarters. So, you can imagine my amusement when today’s events in the media only proved what I was saying. This tactic of packing your Twitter account with either fake followers or following accounts who guarantee to follow you back to make yourself look important & have influence seems to be common to the anti Hs2 mob too. I’ll highlight one of their more laughable Tweeters in another blog. You have to wonder. If the anti Hs2 campaign really does have the genuine mass support they claim. Why do so many of them have to resort to faking figures? One of the many laughable claims from the anti Hs2 campaign is that there’s millions of people who will ditch all other political considerations & priorities to vote for any party that opposes Hs2. Antis try & pretend they have an army of supporters up & down the country who are ready to cause a political earthquake because of Hs2. Like their other claims, this one’s another load of hot air. UKIP, being the cynical vote chasers they are have ditched their 2010 manifesto pledge to but not one but THREE high speed lines & come out in opposition to Hs2, hoping to hoover up all these votes that are supposedly waiting to be had. The problem is, they don’t exist. UKIP have been lied to by the anti campaign that doesn’t command anything like the level of support they claim & certainly doesn’t have a massive vote bank to hand to UKIP. And where’s Hs2 on that list? Nowhere. It doesn’t even rate a mention. People have other prorities. The only people who really care enough to change their vote are some of the people who are directly affected because they live on the route of Hs2. But, many of these people aren’t that die-hard either. Another good example is the supposed anti Hs2 ‘heartlands’ of Warwickshire & the Chilterns/Bucks. In 2013 UKIP were confidently expecting they’d gain a massive amount of new Councillors as people voted for them to show their opposition to Hs2. So, how many seats did they win in Warwickshire? Not a single one! The biggest gains were made by Labour – a party that actively supports Hs2. 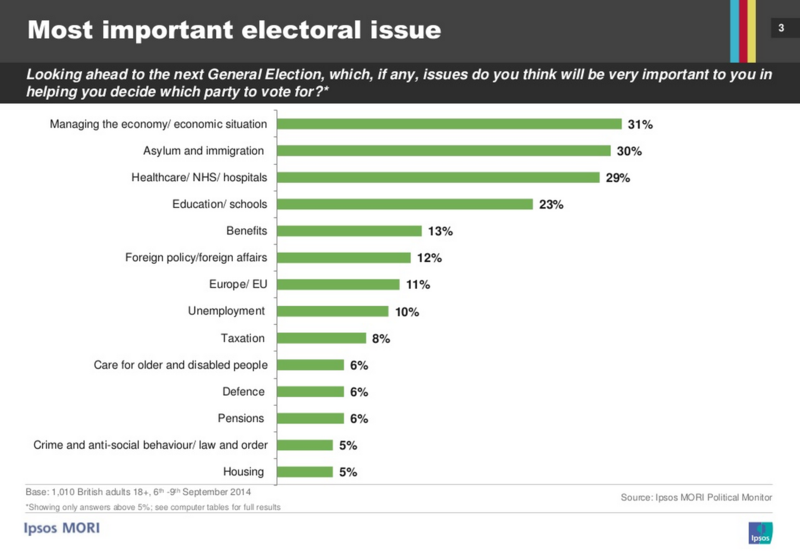 In other areas (such as the North-West) UKIP didn’t even bother campaigning on Hs2, preferring local issues instead. And in Bucks & the Chilterns? UKIP did gain seats there. But it was clear that the ‘Hs2 effect’ was confined to the areas the route will actually pass through. Interestingly enough, the picture for UKIP in the Chilterns has got worse, not better since 2013. In December 2014 there were elections for two Councillors in the Aylesbury Vale district (another supposed anti ‘stronghold). Both were won by, the supposedly unelectable Liberal Democrats! To add to UKIPs woes, both their rebadged former Tory MPs voted FOR Hs2 & one, Mark Reckless put Farage in the firing line by restating his support for Hs2 as a UKIP MP. Farage was forced into admitting that Hs2 is not a ‘big ticket issue’ for the party. 2015 has got off to an even worse start as a Chilterns UKIP Cllr has defected to the Tories. This has exposed the fact that neither UKIP or the Tories are really that worried by the anti Hs2 campaign. It’s been clear for some time that anti’s have been writing political cheques they can’t cash by promising levels of support they don’t have. It seems that fact has finally dawned on UKIP too. The antis also seem to have quietly dropped their ineffective ‘no votes for you with Hs2’ as it scared no-one & didn’t persuade a single MP to change sides. The forthcoming general election has the potential to be a disaster for the anti Hs2 campaign who’ve firmly nailed their flag to the UKIP mast. The party’s been battered in the media & the polls as their extremist tendencies, fruitloop membership & infighting has attracted negative attention, the idea that it will be in any position to deliver on its promise to ‘StopHs2’ looks more & more ridiculous as time goes on.